Think of the motion filed by Craig's lawyers to withdraw his guilty plea as a piñata. Now, piñatas are often donkeys, but Craig's a Republican. I can't find a good picture of an elephant piñata, however. So think of Craig's motion as being a clown piñata. I've been to enough kids' birthday parties and, heck, bought and hung enough piñatas for my own kids, to appreciate that the darned things (the piñatas, not just the kids) can sometimes be tougher than they look. But at least since I read the cover letter under which part-time prosecutor Chris Renz mailed Sen. Larry Craig the proposed motion to enter a guilty plea to disorderly conduct in exchange for the dismissal of a far more serious peeping charge, I've known that this particular piñata is paper-thin. It may be festooned with lots of colored paper and ribbons, but it's poorly crafted. And at its best moment, it was already hanging from a slender, very frayed thread. To extend the metaphor: Think of prosecutor Renz' 41-page response to Craig's motion (a hefty 2.3 megabyte .pdf file) and 33-page supporting affidavit with exhibits (which weighs in at a comparatively svelte 1.7 megs in .pdf) as large broom handles. They're a bit rough in a few spots; they're workmanlike, functional tools, not works of art. And as wielded, they don't quite knock the piñata all the way out of the park. But then again, it's just a piñata, after all, and not a horse-hide covered baseball — and these broom handles are far more than adequate to knock it down and pound it repeatedly until nothing is left but dozens of messy little clown piñata pieces. And the piñata turned out to be empty inside anyway, which I guess really isn't that much of a surprise after all. I think this Wednesday's party hearing is likely to be a grim one for Sen. Craig and his team. 13. On July 17, 2007, I spoke with the Defendant and explained that in exchange for a plea of guilty to the charge of disorderly conduct, the interference with privacy charge would be dismissed. I told the Defendant that the sentence would be 10 days of jail, all of which would be stayed for a year on the condition that the Defendant have no same or similar violations, and a $1000.00 fine, $500.00 of which would be stayed for one year on the same condition. I told the Defendant that this offer was similar to offers made to other defendants with similar charges. I spoke with the Defendant about the process that would occur for entry of the plea, such as how it would be processed, the people that would see the petition, and the ultimate destination of the petition. I explained that the plea petition would be filed with the court and the petition and conviction would be a matter of public record. 14. During the July 17, 2007 telephone conversation, the Defendant expressed that he was in a difficult situation as a result of the nature of the charges and his position as a United States Senator. I responded to the Defendant that I had appreciation for the fact that this was probably a difficult situation and [I] told him that it was a situation regarding which he should seek advice from an attorney. In that phone conversation, the Defendant asked that I send the plea offer to the same address as the Complaint so that he could review it with an attorney. I also told the Defendant that I would continue his arraignment date that had originally been set by the Court for July 25, 2007 for two weeks so as to allow time for him to consider the plea agreement. Although more detailed, all of this is entirely consistent with Renz' cover letter (Exhibit B at pp. 13-14 of the affidavit; also here) forwarding the proposed plea motion to Craig, which I discussed at length in my September 12th post, and which I concluded then had already effectively sunk Craig's present hopes to withdraw his plea. Unless Craig is willing to take the stand to deny the authenticity of the cover letter or deny that he received it — and I don't think that's going to happen — Craig's unlikely to be able to effectively challenge any of these supplementary factual details from Renz' affidavit either. Craig's lawyers may try to spin the facts and the inferences that flow from them differently than Renz has, in other words, but they aren't likely to dispute them directly. And that creates even more serious problems for Craig. One of the most effective portions of Renz' memorandum is his argument (at pp. 35-37) that this history shows that Craig took a calculated gamble that the plea wouldn't be discovered by the press — a gamble that turned out to be a spectacularly bad one, but that after the fact can form no proper basis for Craig to withdraw his guilty plea. Renz also does a decent job, I think, in arguing (at pp. 37-41) — notwithstanding some incredibly pro-defendant, wishy-washy Minnesota precedent creating no effective or even nominal deadlines for motions to withdraw guilty pleas — that in these circumstances, Craig's plea is nevertheless "untimely." He did not argue (as I would have) that it's particularly significant that Craig failed to file a timely motion for new trial (or to set aside the judgment based on the guilty plea); there's none of the "direct attack/collateral attack" distinction that Texas law makes, and that I think the Minnesota cases may permit even if they don't mandate it. Nevertheless, finding Craig's motion untimely is appropriate, Renz argues, "not because the raw amount of time between the plea and motion is itself necessarily substantial," but rather because Craig "appears to be playing games with the plea and its finality" by "announc[ing] that he planned to seek withdrawal of his plea, but wait[ing] in filing his motion to determine the consequences of waxing and waning public opinion, the support of his fellow politicians, and committees of the legislature." Otherwise, today's filings do pretty much what I expected they would. They hammer (and re-hammer) the prosecution's obvious strong points, but also touch on a few more subtle ones. They include a good-sized smattering of helpful precedents (which I haven't double-checked, but I have no reason to doubt that they say what they're represented to say, which is all pretty straightforward). Wisely, they don't re-tread the ground already discussed in the prosecution's motion to strike the ACLU's silly amicus brief, which I've previously discussed (here and here). What's entirely missing is potentially important, but — given how Craig's motion was constructed — no surprise, either: There's no mention, much less discussion, of Rule 15.02 of the Minnesota Rule of Criminal Procedure, as made binding on mail-in pleas by Rule 15.03. Neither is there any mention of Appendix B or Appendix C to Rules 15, which contain forms that at least on their face it would seem that Renz should have followed in drafting the motion to enter the guilty plea. Nor is there any mention of Form 11 — which at least looks like something that either Renz or the court personnel should have insisted that Craig complete before permitting him to represent himself pro se, and that would have certainly cured any alleged Rule 15.02(2) problem with the failure of the plea motion to contain a specific confirmation that Craig knew of, and was making a well-informed and voluntary decision to waive, his right to counsel at every stage of the proceedings, including in connection with the negotiation of his plea bargain and entry of his guilty plea. But Craig's lawyers did an incredibly poor job of showing the violation of any of those rules or procedures in the first place, or of making any credible argument as to how Craig could have been prejudiced by those violations. And on the whole, Renz' memorandum does a decent if a bit blurry job of at least dispelling the notion that Craig could possibly have been prejudiced by such violations (of the rules Renz' memorandum pointedly fails to discuss). It may not be too late for Craig's lawyers to remedy their sloppiness, however. Muddled and ineffective as their written motion was, perhaps at the oral argument they can bring laser-like clarity and precision to their showing that these rules were violated. To the extent that Craig has any hope of winning, that, in my judgment, is what they absolutely have to do. And they'd better come up with at least some straight-faced argument — one better than the utterly stupid and implausible "panic" argument from their motion — to show how Craig was actually harmed by the clear violation of those rules. And so, Mr. Renz, did you tell Sen. Craig that in some other 'similar' cases arising out of this same police sting, you'd agreed to pleas involving deferred prosecution or deferred adjudication? You didn't? Oh-ho, I see. And isn't it true that in all those other cases, the defendants did have lawyers to negotiate such a plea on their behalf? I thought so. So the bottom line, Mr. Renz, is that despite all your mouthing of hollow assurances to Sen. Craig about his rights to see a lawyer, you — knowing full well that he was in mortal dread of anyone finding out about this — were content to see him take a 'similar' but really not very good deal, knowing that if he actually did get a lawyer, that lawyer almost certainly would have explored options that didn't necessarily involve any permanent criminal record, much less a guilty plea — isn't that right, Mr. Renz?" But then again, I also continue to think that Renz ought to pop Craig on the witness stand on Wednesday — and that Craig has far more to lose than the prosecution does if what's scheduled as "oral argument" turns instead into a contested evidentiary hearing. If Renz intends to do that, however, he probably ought to have objected on hearsay grounds to Craig's affidavit as part of his written response to Craig's motion — and he didn't. So maybe his intention is to play it safe, hope that there's no live testimony, and hope his pre-existing advantages from before the hearing carry the prosecution safely through the end of it. Make no mistake: I continue to think that Craig ought to lose, and that it's overwhelmingly probable that he will lose. But as much fun as I'm having watching and reading about all this from afar, like any real trial lawyer, I wish I were going to be down in the center ring of the circus on Wednesday. And yes, I could have fun representing either side. I'm like an old calvary horse, trained to ride to the sound of the guns. And there will likely be a fair amount of pyrotechnic glory in Minneapolis this Wednesday afternoon (even if it's less than I'd try to set off if I were there in person representing either side)! 112 pages, defendant's and state's combined? I'd "pity da judge" if I didn't pity "da fool" who didn't set forth his case in the first three lines of his pleading more. Craig needs to save face. Allow him to do so. Hear the motion, deny it and be done with it. The worse thing possible for him would be to allow him to withdraw his plea. 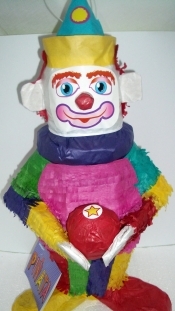 Your pinata clown appears to be racially a white person. Could it be that pinatas which are identifiably brown Latinos don't sell well? I'm no clown expert, but don't most of them put on a heavy layer of white pancake makeup? I thought the reasoning was to make the other bizarre makeup stand out. It's a f****g Pinata, it doesn't have a race. Some of you people are F****g stupid. Always looking to start a problem where there is none. Get that s**t out of here. YOU are the racist! I thought my answer was intelligent. However, your answer, Ron, exposes you as a poopyhead.